Writing from a campsite in Zeeland, in the south of the Netherlands. I've been skipping down the coast with my wife hunting for bunkers from the second world war. A week ago, I met up with fellow Branner fellows Nicolette Mastrangelo and Taylor Medlin in Rotterdam, where I worked one summer seven years ago at the offices of MVRDV. Always good to visit the streets you once roamed. Rotterdam, bombed out and rebuilt--it is the combination of Nicolette's thesis on "cities from scratch" and my own viewpoint on the architecture of war, or that which results from war. But that left us wondering how to incorporate Taylor's work on remote construction. I held a secret hope that we would see some US Coast Guard personnel wandering around the city--yes, the Coast Guard is here in Rotterdam, inspecting vessels bound for the United States. Isn't that amazing to think that the United States sovereign border is extended somehow into Rotterdam Port. The Army is also here in the form of the 838th Transportation Battallion. They receive and distribute supplies for all of the US military bases in Europe. Well we didn't get remote on a Coast Guard boat, and Rotterdam is just not new enough of a city to satisfy Nicolette's taste for barren, failing projects (Almere?) So what next? This is the kind of travel I love--no plans, no expectations, just moving and dealing with set-backs as they inevitably pop up. On a rainy day we went to the beach. Exactly where no one else in Holland was going. So, then, did that make it remote? Scheveningen, we get off the tram on the noorderstraand, where the hell are we? Dashing through the downpour to find some shelter on a street lined with brick housing but with no public spaces or alcoves, all the while Nicolette is shouting "we're in a new city, we're in a new city!" We take shelter in a parking garage. The downpour gets heavier. 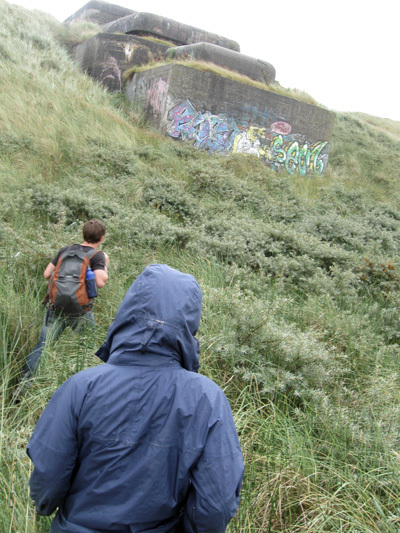 We abandon the option of grabbing umbrellas and as the rain eases up, we set out in search of the Atlantik Wall bunkers. just love those bunkers on the coast line, a pity they are not being used for anything but protected bat caves and as concrete canvas for graffiti.